Who else is trying to eat healthier these days? I love food – all the food – pastries, salads, main meals, everything. Plus all the carbs. But my waistline doesn’t share the same carb-loving sentiment. So I’m on the hunt for healthy meals that are equally delicious. Like this insanely good mushroom fried rice. 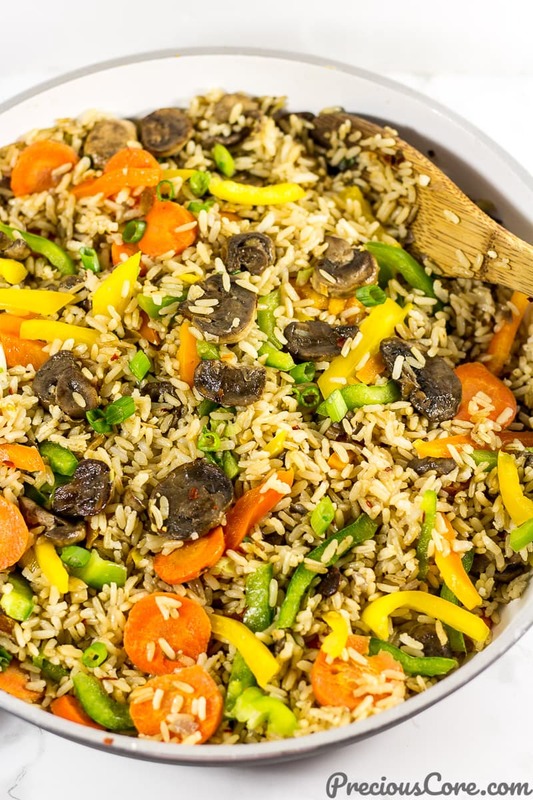 This mushroom fried rice only requires 30 minutes to make if you boil the rice a day before. I like boiling the rice and keeping in the fridge a day before so it is ready for a quick meal. Also, this is one recipe in which you can add as many vegetables as you like. I used carrots and bell peppers here but feel free to add other veggies. Green beans? Peas? Throw them all in! 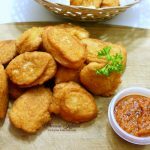 A number of you have requested for African vegan recipes. 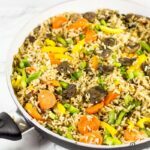 This mushroom fried rice recipe is in response to that request. It is a healthier alternative to regular fried rice recipes. 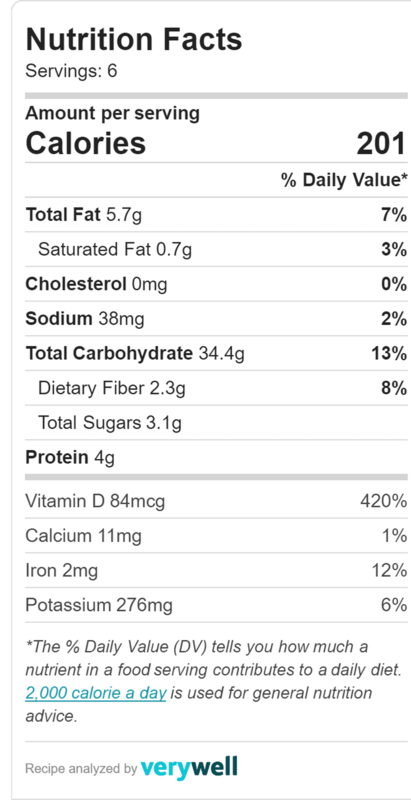 Apart from being healthy it is completely vegan! I love the meaty texture of mushrooms. In fact, I could replace meat with mushrooms in always any meal. I love mushrooms! The key in meals like this is to season properly. 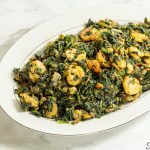 I use garlic, ginger and white pepper to elevate the taste. Don’t go easy on the spices in this one! 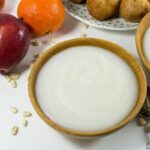 This recipe makes 6 servings and one serving is only 201 calories! Whoop! I have this lovingly kept in my fridge so I can scoop out some for a complete meal. This recipe is very good for meal prepping. Place the rice in one big bowl or divide it into meal prep bowls for easy lunches or dinners. 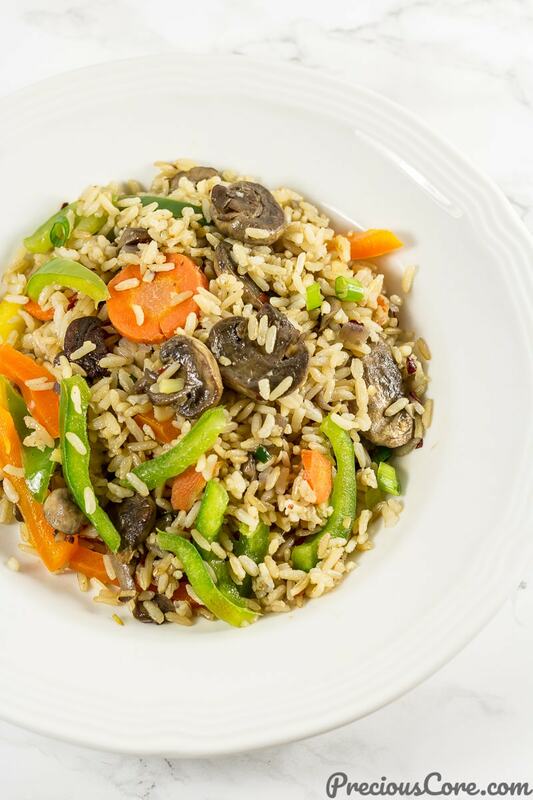 I love 30 minute meals like this healthy insanely delish and vegan mushroom fried rice! It comes together in no time especially if you precook the rice before and save in the fridge. You won't miss the meat in this one! Place oil in a large fry pan or wok and let it heat up on high heat for about 2 minutes. Saute the onions, garlic and ginger together until fragrant. Add in the mushrooms, sprinkle on some salt and half of the remaining white pepper. Stir well and let them cook until the mushrooms turn darker in color. Add in carrots and green onions then mix. Add in the rice and stir well to combine. Put in remaining white pepper and mix well. Taste to ensure that the seasoning is right. Add in the bell peppers and mix until well incorporated and the peppers sizzle together with the rice. Turn off the heat and serve warm. 1. I didn't use soy sauce in this recipe because honestly I don't use soy sauce that much. Feel free to use soy sauce instead of salt if you wish. If you choose to use it, add a little at a time then mix and taste until you get the seasoning right. 2. My favorite brown rice to use is Uncle Ben's natural brown rice. I find that this brand is not as chewy as the other kinds of brown rice I have cooked. It makes eating brown rice easier from me. 3. Feel free to add other vegetables you like to this recipes. Peas will be great in here as well. Basically, this is a way to add a lot of vegetables to your meal. 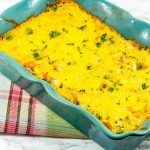 BAKED CHICKEN AND RICE CASSEROLE + GIVEAWAY! All ingredients makes this meal my favourite. 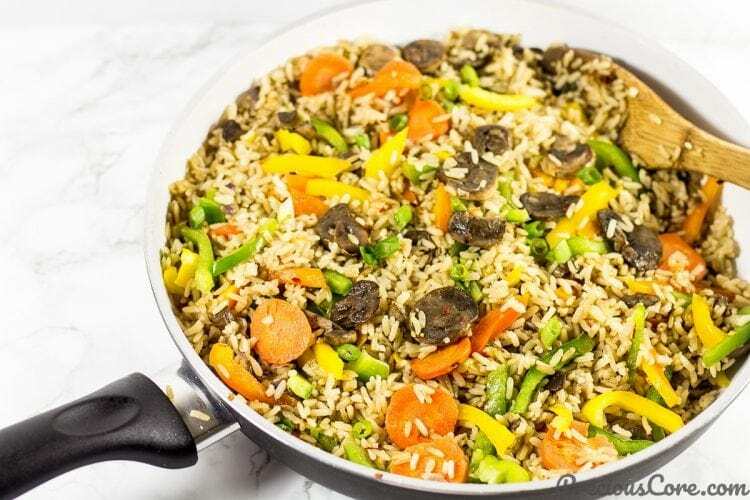 Anyway this mushroom fried rice looks so, so delicious and tasty, full of colors and healthly. So glad to inspire you, dear. Thanks for your comment!